Update: Dec 2014. I originally blogged the above back in 2001. Lidsky’s brief article, written as the dot-com economic bubble was collapsing, introduces small-business owners to the concept of usability testing. Executives who didn’t themselves know very much about web pages were, at the time, paying big bucks to anyone who could slap together some HTML. The medium was changing so rapidly that nobody really knew in advance what would work. 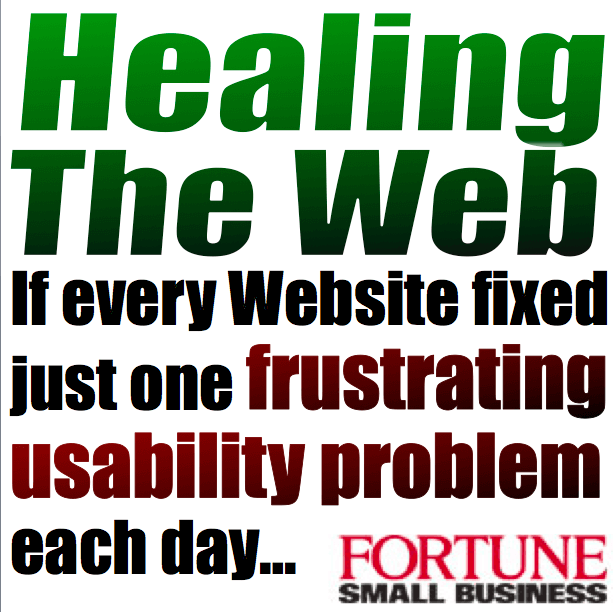 Usability evangelists like Jakob Nielsen worked hard to convince decision-makers that when they are building a website, they should not design it for themselves, or for their powerful peers, but for their rank-and-file visitors — who often have very different reasons for coming to their website. When my students design web pages, I give them general tips for writing effective online text, but I remind them that I am not the one who determines whether their work is useful and valuable. Neither is the client. Convincing clients to listen to their end users is difficult, because the clients already know the organization so well, and the clients will already have a strong idea about how they wish their end users will interact with the site. A well-designed usability test captures a real user’s actual behavior, producing data that the designer can use to improve the web text. A client who is frustrated that visitors aren’t clicking on the “Join” button may say “Make the button bigger.” But a visitor who hasn’t yet decided to join probably won’t be convinced just because the “Join” button is flashier. What your visitors really need is not a bigger “Join” button, but a more compelling reason to join — and that may be because they are looking for something specific (a phone number? a schedule of upcoming events? a FAQ page?) that is buried on the site, or hasn’t been written yet. Usability experts can offer general advice. Shrink that logo. Trim that mission statement and move it to an “About Us” page. But the real value comes from asking your rank-and-file audience what they actually want to see on the home page instead. If you can give them more of what they want, you can better prepare them to absorb the message you want to deliver. A usability study is designed to measure how well a site accomplishes its goals. For most of corporate America, the company Website isn’t there to entertain. It’s there to convey information, help visitors complete a task, or sell something. As a journalist, my visits to company Websites fall into three categories: I’m looking to learn general information about the company and its products; I need one fact or to check a fact; or, most likely, I need to talk to someone at the company and am looking for a press contact. Customers may have different goals than journalists, but they’re not there to play around. Some time in 2014, I noticed a lot of traffic on my website comes through this page, and I noticed the link to the Fortune article was broken. Now the link points to an archived version of the article, and I have expanded the post a bit. 24 Jan 2001 in Business, Cyberculture, Design, Media, Technology, Usability.